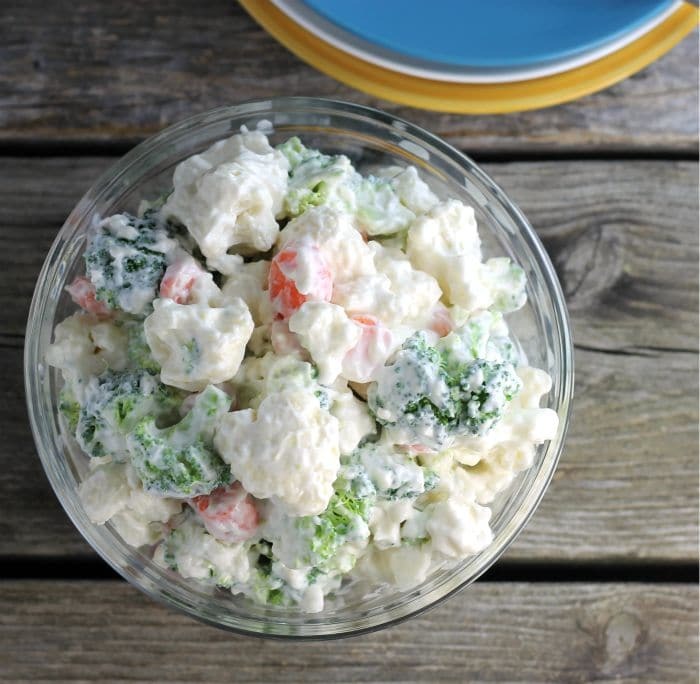 Cauliflower broccoli salad is made with fresh cauliflower, broccoli, and carrots and the creamy dressing is a mayonnaise and sour cream base. It is sure to be a salad that your family will fall in love with. I have mentioned before that I grew up in a family that tradition is important. When we find something that we like we stick to it and we don’t stray. This recipe is part of a tradition, I make it for Thanksgiving and Easter every year, just like clockwork. And you know what no one complains. Everyone is just happy to see that the salad is sitting on the table waiting for everyone to dig into it. Even though there is a ton of food for these holidays there is never a lot of this salad left in the bowl at the end of the day. This year I made it for the Labor Day weekend, a couple of our kids were at the house for the holiday. We made hamburger and hot dogs on the grill for dinner. 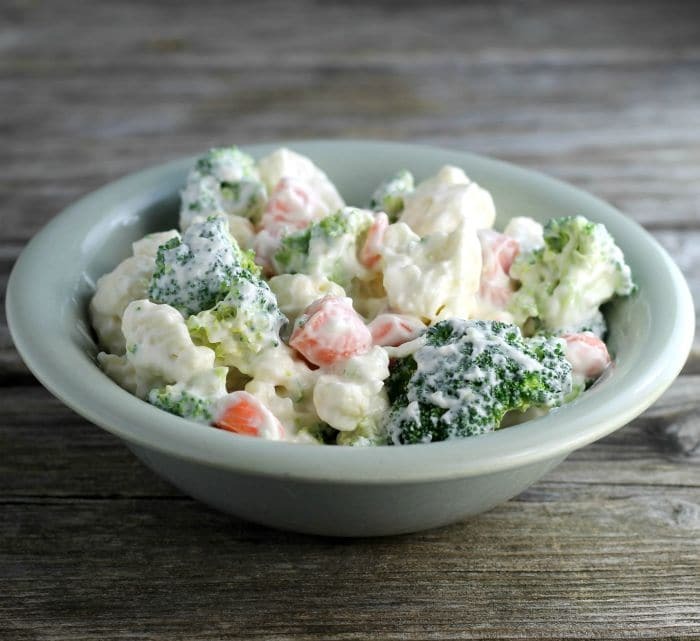 I thought the cauliflower broccoli salad would be a great addition. So yes, it a great addition to just about any dinner from Thanksgiving to grilling out. The recipe is easy to make and you will have it made in no time. It consists of simple ingredients. As for the vegetables, there is broccoli, cauliflower, and carrots. 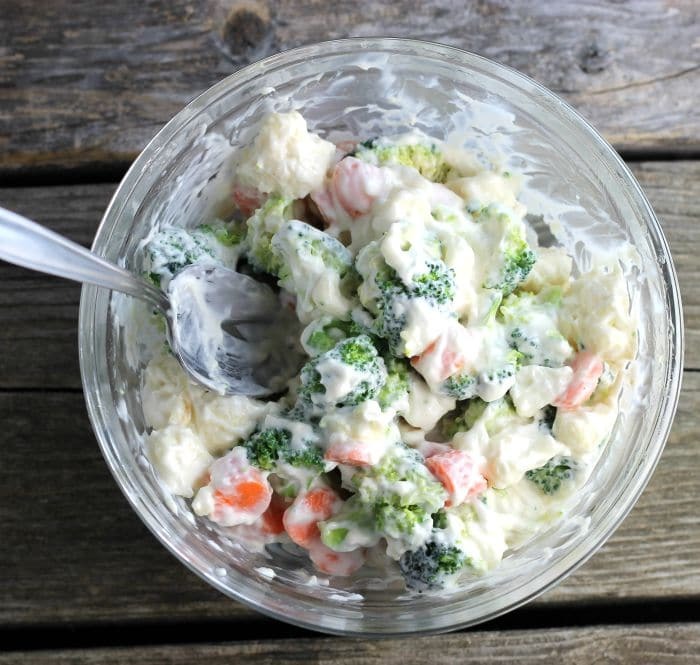 The dressing is a mix of mayonnaise, sour cream, a bit of sugar, garlic powder, and salt. 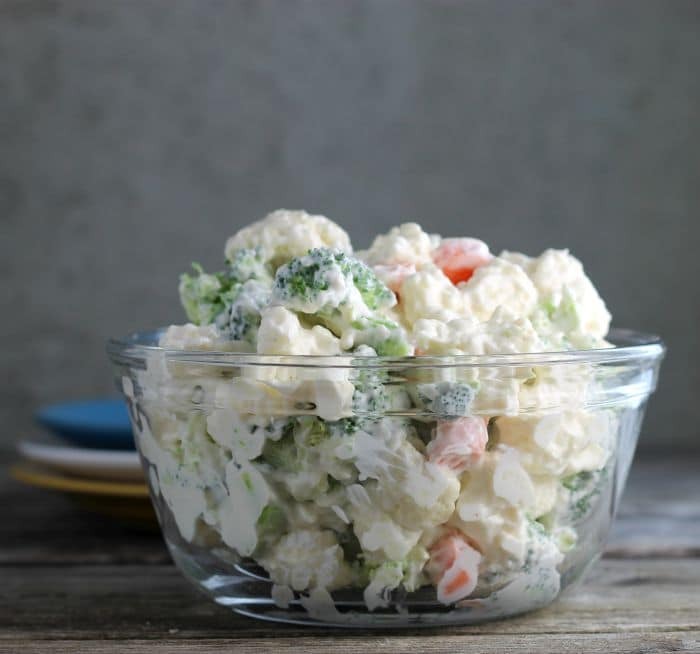 Cauliflower Broccoli Salad is a cold side salad that is covered in a creamy dressing and is a great side dish to make for a for a large group. Cut the cauliflower and broccoli into bite size pieces and slice the carrots. Combine the mayonnaise, sour cream, sugar, garlic powder, and salt mix until well blended. Add the vegetables to the dressing and toss until the vegetables are well coated. Refrigerate until ready to serve. Sounds good, thanks for the recipe, Dawn! This sounds so much like a salad my mom made when I was growing up, and it’s still one of my favorites. But instead of broccoli there are pea pods. Even when she made a double batch we never had leftovers :). I’ll have to add some broccoli next time I make it! Looks delicious and healthy…now I will have to persuade my husband to eat this too. This sounds so delicious! I think I would throw in some dried cranberries for a pop of sweetness and serve for thanksgiving! This totally sounds delicious for summer grilling, Dawn! And I can see how this became a family favorite at all holidays, too. In fact, one of the best parts about holidays is eating those family favorite recipes like this one. We are planning on grilling out this weekend, and I might have to give this a shot. I love the addition of sour cream instead of all mayo, too! Excellent combination of ingredients in this salad, Dawn! Do you first boil the vegetables? Thank you Agness! No, the vegetables in this salad are raw.